... and now Intel is in on the "wearable" action hot on the heals of Google and Apple. 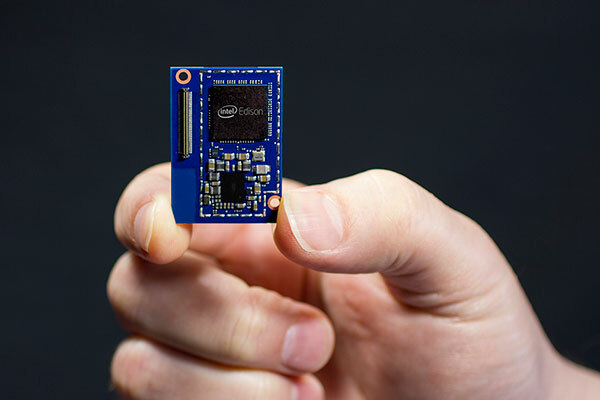 In January this year, Intel announced a new tiny computer called the Intel Edison that would be the size of a standard SD card (Secure Digital) but pack a punch with some impressive technical specifications which could power many projects within the Internet of Things industry - specifically wearable computing. To top it off, it is available on its own or as an Arduino compatible board which allows them to reach out to an existing developer base. ... on the size of a postage stamp,"
Taking a quick look at the product specifications - how powerful is it really? From a developer point of view it uses Yocto Linux v1.6 as the main operating system and provides support for Arduino IDE sketches, Eclipse supporting C, C++ and Python and Intel XDK supporting node.js and HTML5 which covers a large range of developers and purposes. The standalone Edison is priced at $50 US and the kit for Arduino is available for around $100 US at various vendors (currently only available as pre-order) - since the announcement was only done by Intel yesterday. I have played a little with the Intel Galileo and the Edison looks to be it's little brother and just as much fun but with more power and possibilities.